When applying the NestDivert the surface to be bonded to should be: dry, dust and grease free and thoroughly clean. Avoid touching the exposed adhesive surface of the tape as this impairs its performance. The ideal cleaning method should incorporate use of a: solvent, such as: Isopropyl alcohol. To attain the optimum bond strength sufficient pressure should be applied to the tape to ensure a good adhesive “wet out” on the substrates. This tape is a pressure-sensitive adhesive, and the best results are achieved with maximum surface contact under pressure. Press NestDivert into place with sufficient pressure and leave for the bond strength to reach its optimum strength after 24 hours. Non PVC soffits need to be sealed correctly or bond will not be possible. 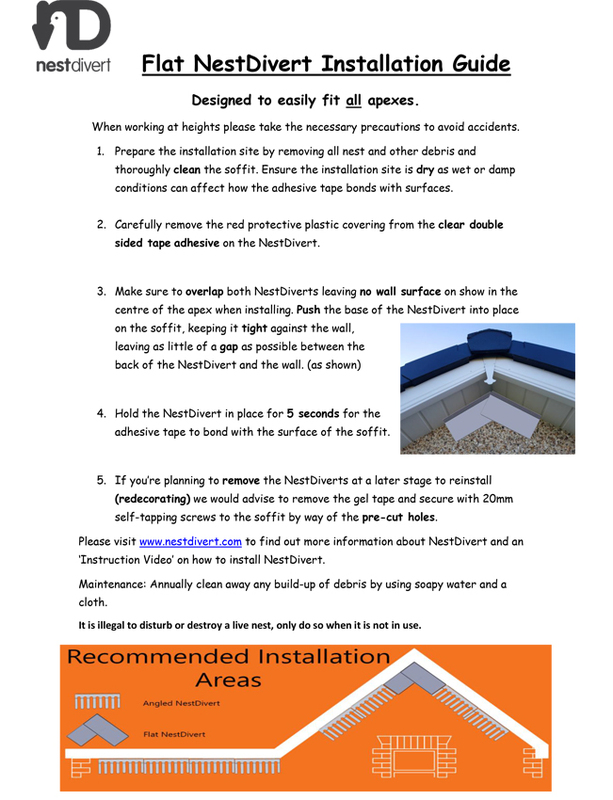 Flaking paint or rotting soffits will need the NestDiverts to be secured using self 15-20mm tapping screws. We recommend replacing rotting soffits and/or sealing the soffit with a standard outdoor wood paint. It is illegal to disturb or destroy a live nest, only do so when it is not in use. Not purchased your NestDiverts yet?